Thank you for bringing this matter to our attention. We regret that your experience was not a great one and understand that you have chosen another company for your flooring needs. If you continue to have any future questions or concerns please contact us at customersupport@empiretoday.com. Contracted to put carpet in two bed rooms. Both room had laminate flooring that was to be removed first. The first group that came out stated it was not on the work order to remove the laminate and it was too much work. After numerous calls to Empire and not able to contact anyone locally, another group came out 10 days later. This time they stated the floor under the laminate had absetoes and they could not continue. After some calls again to Empire, cancelled the project. Contracted the project locally to Buddy'S Carpet. Did an excellent job and saved $500. Would not them carpet my dog house if I had one. Review #871713 is a subjective opinion of User871713. Thank you for bringing this matter to our attention. 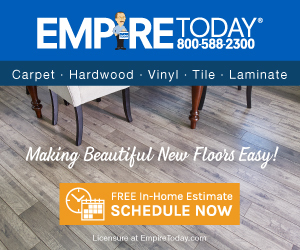 We regret that your Empire experience was not a great one and understand that you have chosen another company for your flooring needs. If you continue to have any future questions or concerns please contact us at customersupport@empiretoday.com.